I was listening to a podcast recently by Michael Hyatt in which he was discussing life priorities. When asked what his top priorities were, he replied that his relationship with God comes first, followed by – Well, I was just sure he was going to say his family, but I was surprised and intrigued by his 2nd priority. His next biggest priority, he said, was himself. At first I was confused, but the confusing only lasted for a couple seconds before the light bulb came on. I’ve been taught all my life to put others first and put myself last. 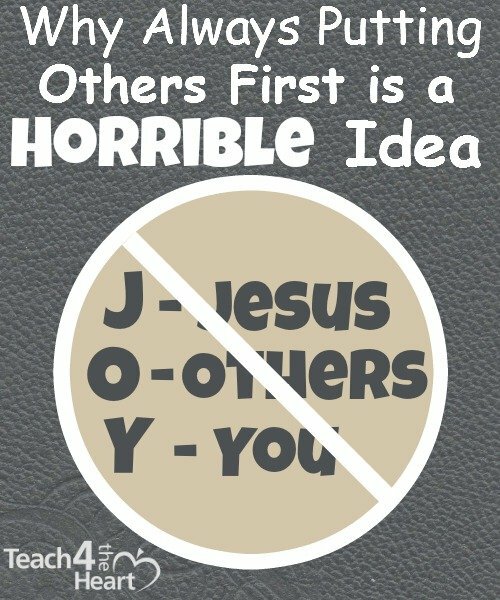 I think back to the song that goes “Jesus then others then you, what a wonderful way to spell JOY………Put yourself last and spell joy.” And we are absolutely right to teach young people that they are not the center of the universe and that they should put the happiness of others above their own happiness. But we get into trouble when we take this concept to mean that we should run ourselves ragged taking care of everyone else. That we should ignore and even neglect our own health and needs in favor of caring for the needs of others. If we don’t take care of ourselves, we limit our ability to pour into the lives of others. I think teachers are particularly prone to give, give, give of themselves until there’s nothing left. We go, go, go and push, push, push, often at the expense of our own health or our own sanity. But when we’re exhausted or sick or just plain running on empty, we aren’t nearly as effective as when we are well-rested, healthy, and enthusiastic. So we’ve got to stop putting ourselves last. This doesn’t mean that we should be selfish and put our own desires above the desires of others. It just means that we need to put our own health and well-being near the top of our priority list so that we can continue to impact lives and help others for years to come. So many teachers quit teaching, and while the reasons are vast and varied, not taking care of ourselves has certainly got to be a contributing factor in many cases. So don’t let yourself be a statistic. Let’s look at a few ways we can make our own health a priority and avoid burnout. Rest. Probably the most important thing you can do is to go to sleep. The stack of papers really can wait till tomorrow, but if you don’t get enough sleep you’re not going to be on your A game. So shut off your computer and go to bed. And stop feeling guilty about taking power naps. Instead, start planning them more often. Make time to exercise. Don’t think you have time for exercise? You’re still thinking that you need to put yourself last. Exercise has so many benefits, and it will make you a better teacher. So find a way to squeeze it into your schedule, even it if means telling someone no or cutting something else out. Check out the post “How to Find Time to Exercise” for more helpful ideas of how to make this happen. Eat well. Healthy eating doesn’t have to be complicated, and it doesn’t mean you can never have desert. Just make wise choices. Your health is worth it, and you’ll feel a lot better too, which, in turn, will make you more effective. Guard your voice. We teachers need our voices, yet we are so often losing them. I really struggled with my voice for a year or two until I learned better how to take care of it. We need our voices to be effective, so check out the article 5 Things to Try When You’re Losing Your Voice for tips on how to keep your voice strong and regain it if it’s going. Take time away. We need time away from school to get perspective, so don’t feel bad about going away for a weekend or simply having a nice night out. Instead, get intentional about planning these types of breaks. They’ll leave you feeling more balanced and ready to tackle a new week come Monday. Reflect. Take time to think not just about school and your classroom but also the other aspects of your life. Reflection not only keeps us centered but also allows us to identify problems and determine solutions. Work on your spiritual health. If our spiritual health is suffering, the rest of our lives will suffer as well, and we will not be as effective as we should be. So make spending time with God a priority. His working in you is truly going to make the biggest difference in your life both personally and professionally. Do you feel guilty spending time on yourself? Or have you realized how important taking care of yourself really is? Share your thoughts with a comment below. There is that would be rich, yet hath nothing; There is that would be poor, yet hath great riches.. Proverbs KJV. This isn’t biblical at all. The bible teaches to put others first, but in a very subtle way you’re saying its wrong. That the bible is wrong. The Bible talks a lot about loving others, serving others, and treating others as we would want to be treated. It even teaches us to esteem others more than we esteem ourselves (Phil 2:3). Absolutely. I’m not disputing that one bit. What I’m saying is the acroynm “Jesus, Others, then You” is not Gospel. It may be helpful in teaching children to think of others, but it can be detrimental when we take it to the extreme and go-go-go always serving others without taking time to rest. Because the Bible also teaches the importance of rest – and we simply cannot continue to serve others well if we burn ourselves out. I think of all the times that Jesus left the multitudes and disciples to spend time alone with the Father.